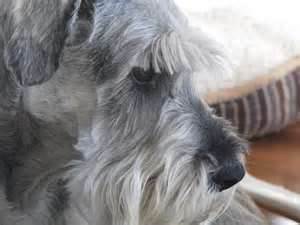 my husband and i purchased zach a 5 year old male schnauzer at that time pepper and salt. zach came over to the both of us and picked us for his new family no one else wanted him, he was straggly and out of sorts, and i had a talk with zach and i told him that he was coming home with my husband and i and he was so excited and happy that finally he was going to a home where a family wanted him. well a year goes by and hes doing good everything was good till last night we had to take him to the pet hospital because zach got really sick on us, they ran tests on him and found out that this little happy go lucky fella had diabetis non cureable, sugar high, and dehydrated, they said that he wasnt going to live the night because he was in alot of pain and suffering really bad. so they suggested us to relieve all of this for him by putting him down and thinking and putting him first what was best for him, so that's what we did. he was 6 years old and 22.7 lbs. the life that we had with zach being so peppy and happy is now gone and nothing but sadness and sorrow and memories. you are now up in heaven my little friend, you will always be remembered and missed. passed away 12/23/2012 merry christmas my angel! The terrier mix ... sorry I can't help you with.. I hope you and your hubby find another either female or male, to fill your household again and to love.. please keep us up to date..
Oh.. I have tears in my eyes, too. It makes me think of my boys, REBEL 1 & RINGO, that have now gone over to Rainbow Bridge....PLEASE Read My Story on the RAINBOW BRIDGE Site, because if I write it I'll not be able to see with tears.. Remember that Zach has not gone, he's just in the next room and watching over you and he DID spend Christmas with you, even though you couldn't see him .. don't leave an empty home too long before you get another, as when we say goodbye to our Loyal Companions our home is never the same without ... At least he had a wonderful be it short life-time with you and was loved and still is.. We can Never replace but we can find love again.. Remember the happy memories... I'm still in tears.... Rest In Peace, Zach. With tears in my eyes I wish you peace in this tortured time. I know the feeling and I wish you well. May he rest in peace and may the Lord hold him until your reunited. But first of all, to let you know that I arrived okay. I'm writing this from the Rainbow Bridge. Here there is no more tears of sadness; there is just eternal love. There's so much we have to do, to help our mortal man." God and I are close to you in the middle of the night. Remember there could be no flowers, unless there could be some rain. Now, more than ever before, my life to you is closer. That as you give to the world, the world will give to you. Then you can say to God at night and "my day was not in vain." Lend a hand to pick him up as on your way you go. Remember you're not going. You're coming here to me.